5:30 a.m. I'm up before the alarm clock and out of the house, hitting I-10 east to Mountain Avenue and Mount Baldy, the nearest of the SoCal summits. The plan is a no-frills hike up the Ski Hut Trail starting from Manker Flat, elevation 6200', on to the top of Mount San Antonio, elevation 10,000' or thereabouts. The weather is cold: damp and foggy. Snow showers and foul skies are the forecast of the day. I'm looking forward to climbing in a little snow, provided things stay well-behaved. Thoughts of risk are on my mind. 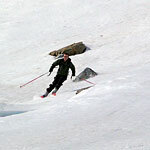 What sort of conditions will I and ski partner Bill find on Mount San Antonio's Baldy Bowl, I wonder? A dicey January snowpack? The more typical SoCal just-hanging-on snowpack? Or something in between? Bill and I ascend the Ski Hut Trail through waves of fog, hiking skis-on-packs across bare trail and the occasional snow patch, until at last the fog breaks and Baldy Bowl pokes out ahead. And of course, the reality of Southern California Skiing is that there's a lot more sun than storm, so it should come as no surprise a little higher that the fog parts to reveal a bluebird day above Baldy's South Bowl, cloudless from horizon to horizon—at least for the moment. Still, I'm a little annoyed I didn't put on more sunscreen. We take a quick break at the ski hut, where other mountaineers are putting on crampons and gearing up for the snowy bowl ahead. 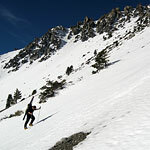 The Manker Flat/Ski Hut Trail is the Southern California training ground for snow climbing and winter mountaineering skills. Fast-changing conditions, rockfall, and steeps make for perhaps a little spicier adventure than many of these first-timers are expecting, but that doesn't seem in the least to dampen the route's popularity. Bill and I don crampons and head straight up the bowl, eying a variety of savory ski lines (Girly Man Chute among them) for possible descent. I had planned to be scrupulously honest and dig a snow pit on the way up, but it is evident that any such effort is moot. Despite the recent snowfall, despite the fact that it is January 3, midwinter, I can see that the Southern California sun has already burned the snowpack to consolidated corn, top-to-bottom on these south-southeast aspects. If anything, the concern today will shift from propagating fractures to wet slides. We are perhaps an hour from the summit, eta 11 a.m. or so, but I'm already wishing we'd gotten an earlier start. An hour later, I'm on Baldy's east ridge, where the snow has shifted toward the more expected January coldpack, mini-fracture included—and now great clouds of billowing fog begin blowing in from the north, swirling about the summit. Within minutes, the magnificent L.A. Basin views vanish, replaced with featureless gray. I make a desperate dash to tag the summit before all landmarks vanish. While I have some confidence in my ability to navigate down in near-zero visibility, I've no desire to test that skill unless absolutely necessary. Bill and I ski down and south in swirling fog, traversing above the rocky spine that guards the chutes above Baldy Bowl. What happened to that sweet corn snow, we wonder? Our edges skitter nervously on fast-hardening ice. This is a not-so-fun consequence of the way Mount Baldy straddles desert and ocean air masses. The fog brings a sudden influx of moisture, saturating the top of the snowpack, which then quickly freezes. In the span of a few minutes, the snow has gone from hero-velvet to watch-yourself ice. We ski down to the top of our intended chute, a fine-looking 45° drop to the bowl. Only now, in the fading light, I can clearly see a clear veneer of frozen water (a.k.a. ice) decorating the top of the snowpack. Bill and I exchange glances at the chute and each other. 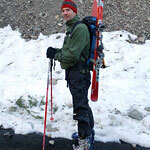 Given my adventures on ice last year on nearby Cucamonga Peak, I'm in no mood for any similar frights. I tell Bill I'd be happy to traverse back around to the easier slopes of the bowl. He's in no mood to argue. A few minutes later, we're cutting turns on the broad south end of the bowl—a much safer option than the chutes. 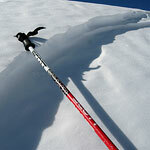 The snow is soft but rapidly hardening, demanding a little extra concentration, but still good enough to call it fun. We snap a few shots of each other, and then we're back at the ski hut, ready for the long 2000 vertical foot hike back down to the parking lot. Nice write up Andy. SoCal skiing is so hit and miss, but it's less than an hour drive away. Good summary. Saw you and your friend both at the hut and on the way down. You guys looked like you were having lot's of fun. I wanted to ski myself but have to wait a few weeks since I just had surgery the previous Monday. And yes, it got very icy and dicey later that day. I got a bit off route on the way down and found a poor fellow sans crampons and axe near the top of the summer trail switchbacks. I cut steps for him for about 1.5 hours and he made it to the hut OK . I was knackered. Didn't plan for an epic, but they sometimes happen. Probably see you out there later this season. Take care. we want to go sleding with our little ones on sat 1/09 at Manker Flat -- is there snow there? i've skied the north side of cucamonga two years in a row now--i recommend hitting it in april. there are several chutes, each with a mile of skiing if you start from the summit. the best is the second from the right as you face the mountain. last year conditions were great, except for the approach--should've stayed off the snow ascending. Sorry--Don't know if there's still snow at Manker. Things have been melting out quickly, though. I'm going to guess yes on the north aspects. Tony, where do you begin your approach for Cucamonga's N. Face? So you still recommend against taking the ski lift and doing Devil's Backbone? The downside to taking the lift is you can't get as early a start, you have to pay for a ticket, and there's almost always a nasty section of the trail that requires crampons and axe (I call it the 'step'). Weird, I have yet to be out on the Bowl when getting an early start was a good thing. It usually meant I spent an hour sitting around at the top waiting for the snow to thaw so I didn't kill myself on the way down. But thems was spring conditions, and the snow may be better right now. Thanks for the info! sounds fun we are going to try and hit it friday this week (2.27) i wonder how the snow is.